Given how late the last update was, I might as well post this one early. 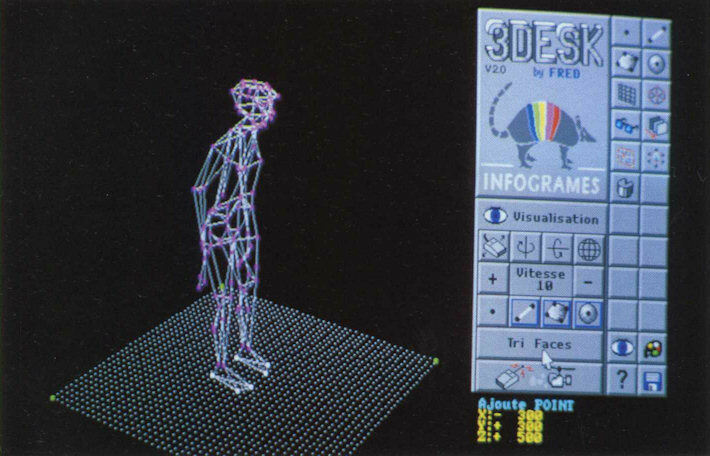 Me - For PCs in the early '90s, the only real 3D modeling software available was AutoCAD and it was not at all suitable for modeling things like game characters. Before models could be made for Alone in the Dark, they first had to write the software to make the models. That software was 3Desk. 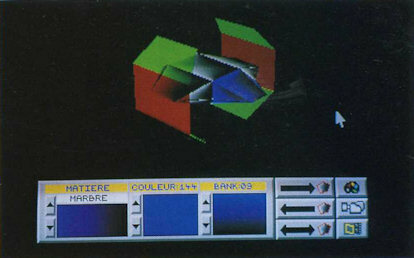 At a general level, most modeling software today looks pretty similar. You've got three views: top, front, side, usually rendered isometrically; and a re-positionable camera, rendered in perspective. You typically manipulate your model using one of the three views and then see what it looks like through the camera. It works like that because all modern modeling software copied its interface from the long line of modeling software that came before it. Because there were no predecessors to base its interface on when 3Desk was written, it's no suprise that it looks very, very different. The idea for Alone in the Dark came from Alpha Waves, and the paradigm that 3Desk operates under was borrowed from the same source. Alpha Waves is all about the cube, and 3Desk likewise is nothing but cubes and cube parts on a cubic stage. The model is drawn inside a bounding cube, which can be freely rotated in front of a fixed camera. Texturing and animation is done in the same cube. 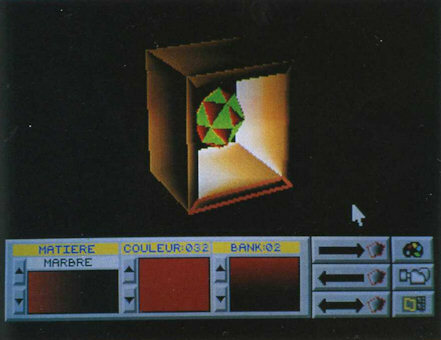 In fact, based on how models interact with each other and the environment, I believe the bounding cube is actually part of the model, though invisible in the game. Here is the next installment in the adventures of the Call of Cthulhu: two months ago, we already presented the first developments of this gigantic project from Infogrames; it has made great progress, what with the programming being almost in the final stage. Here is our interview with Frédéric Raynal, the princiapl programmer. Joy - So, where are we since the last time? Frédéric Raynal - We are creating some tools that will lay the technical and visual foundations of the game, that is to say some mini-programs that you use to "modelize" the enviornment. Joy - Can you be more precise? Clarify, as they say? FR - Of course. We have, on one hand, a 3D object editor, to create the characters, the monsters, and the game objects. It also allows for the colorization of these characters according to their position and the ambient lighting, thanks to the advanced polygon filling techniques. Joy - How do you manage the characters as objects? Joy - This 3D tool, how long did that take to make? FR - In total, 4 months. Joy - And you have been on this for how long? FR - 2 months... Another thing I am working on is the animation speed: it will be constant regardless of the machine the game will run on. What will change will be the number of intermediate steps in the animation, so that the speed will always be normal, like in a film, but the animation will just be a little jerky on slow machines. It's a choice, we preferred to keep the game in real time. Me - That's confusingly written. The rendering algorithms came first and took two months to write. The modeling software, 3Desk, came second and took an additional two months. Four months total. 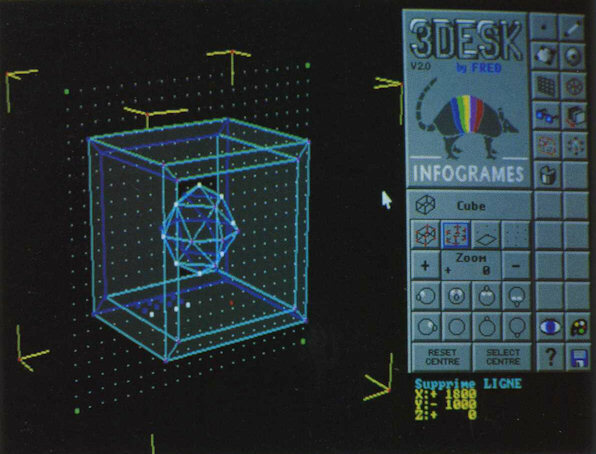 Before 3Desk, models had to be created by manually typing out each co-ordinate of each vertex. The keyframe animation he's talking about was also a new concept at the time, and while Alone in the Dark was far from the first game to not tie the game speed directly to the processor's speed, that was still a common practice in the early '90s. Caption: A colored object. Note that certain faces are translucent. Joy - And the light? Tell me about the light, because it seems to be an important element in the game. FR - You said it, it's even MORE important. Everything is based on it, on the atmosphere. This is the first time it has been done: we have created routines that plot unique polygons, which allow the texture and the color of objects to change during playtime, including their light reflection, their shadows, etc. Joy - Okay. Earlier, you said "on one hand"; what is on the other hand? FR - It is the program that Frank Girolami is working on. Joy - Oh, well then, in that case, I will address him directly, like if it were a proper interview, then. Frank, what are you working on? Frank Girolami - I'm working on an occupancy volume digitizer. Me - I guess. Google's never heard of an "occupancy volume digitizer", but then again, it's never heard of "un numériseur d'occupation volumique", either. Joy - Ah. Uh... ah. Oh. And what's that? Joy - You have taken how long, in total? FG - 3 months. I have been here a month and a half, so me, I'm also halfway. When these two utilities we are working on are finished, 90% of the job is done, since all that remains is to encode the graphic data and scriptwriting. Joy - Can you specify what the director did? FR - Like we told you, he shot a real video clip, that will never be shown to the public, but was what we used to decide on camera angles depending on the action. In fact, it works like a real film: he filmed entire sequences, with some actors, some lights, and all. As it is, Call of Cthulhu will be halfway between a 3D adventure game and virtual reality. VIRTUAL REALITY the wave of the future of the '90s. FG - I would also say that the game will be full of digital images, over 500. Because we have all the designs for the CD version, which will be the most advanced. After all, according to the machine it is run on, we remove this or that detail. We want to push every [an affectionate term for a computer that really doesn't translate -- if you're Strongbad, insert "Compy" here] to its maximum, it is not a simple port. Me - They must be counting each background layer as a separate image. And there is no graphical difference at all between the floppy and CD versions -- just audio. Oh, and the CD version comes with a PIF file and an icon so you can start it from Windows 3.1. Caption: Once the object is created, one can define it by applying textures, that is to say, by specifying what the material will resemble: marble, wood, plastic, etc. Next, in each material, one chooses a color. Even with a color and texture, the object can be moved in any direction and turned on itself, in real time. Joy - And how will the combat be handled? FG - Ah, good question. FR - Indeed. Well, it will be unusual and very new: when the character will fight with a sword, for example, there will be no predefined position for the sword; it will happen by itself, you instinctively move the joystick and the sword will follow. I cannot explain to you the exact algorithm, we want to keep that secret right now. Me - They want to keep it a secret because it doesn't exist. There's no joystick support at all, much less the Wii MotionPlus stuff they're talking about here. FG - And when the character will grab a different wepon, he will be transformed; for example, if he finds a sword, he will change into a knight, if he finds a spell that transforms him into a bat, he will transform instantly and suddenly the height of the camera will change, since a bat can fly. Me - ...Franck, what game have you been working on? Caption: This man is composed of a whole lot of simple objects. For his animation, the point of attachment of each object relative to that which it is connected to is shown, and the degree of freedom of movement. When it is finished, he walks like you and me (especially you, if you are lanky). Me - Notice the absence of a skeleton. Skeletal animation had yet to be invented in 1991. This is just guesswork on my part, but from seeing these and other screenshots of 3Desk, animation is accomplished by moving the vertices of the polygons relative to the model's bounding cube. Joy - All in real time? FR - Yes, with a precision pushed to the extreme. If you walk down the street at some time, you can see a procession pass; if you had been there a minute earlier or later, you do not see it, he will have to wait, or it will have already passed. Furthermore, the characters will change their attitude depending on what the player will do. Me - Okay, I'll be charitable and say that, yes, there are some things in the game that can act independently of the player being present to witness them. I can only think of three... and two of them are kind of the same... and you really don't want any of them to happen... but there is a tiny kernel of truth there. As far as changing attitude goes... I suppose in the loosest possible sense. Like, if you pull out a knife... your character holds a knife. 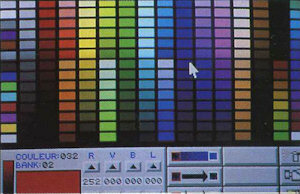 Caption: The palette, which allows for the creation of the necessary gradients of shadow and light effects. Joy - And who is the director, anyway? FG - He is called Guy Selvart. 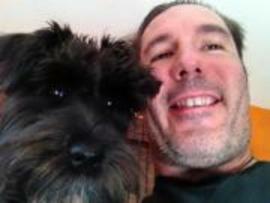 He was a director of photography and has already produced several short films. Me - I can find nothing about Guy Selvart online -- and I don't just mean this guy, I mean I can find nothing online about anybody at all going by the name Guy Selvart. Nor are there any Selvarts on IMDb. The guy's either fictional, dropped off the face of the Earth in September, 1991, or Joystick misspelled his name. They do seem to have a problem with that. They managed to misspell both Frédérick Raynal and Franck De Girolami and they're actually talking to them right now. Joy - Good. You are not behind on your scheduled release date? It still comes out in October? 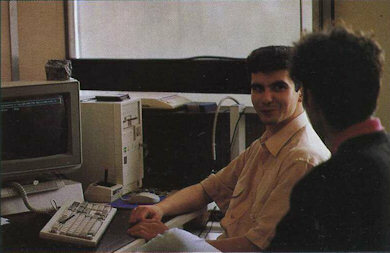 Caption: Fred, front-facing, in the yellow shirt, and Franck, back-facing. Photography is a profession; unfortunately, it is not mine and I do not have a photo of Franck's face.